A huge alien planet turns super-slow somersaults as it hurtles through space, dragging its four sibling planets along for the topsy-turvy ride, a new study suggests. The giant exoplanet, known as 55 Cancri d, gets tugged by a faraway companion star as it orbits its own parent star. As a result, the planet performs a flip over the course of millions of years, and the other four planets in the system follow suit, researchers said. "It kind of shepherds along the other planets," study lead author Nathan Kaib, of Queen's University in Canada, told SPACE.com. The axis of a planet runs through its center; the planet spins around it each day. The axes of most planets tend to line up more or less with the axis of their star. Most planets change the angle, or precess, slightly over time, but only a few swing significantly. 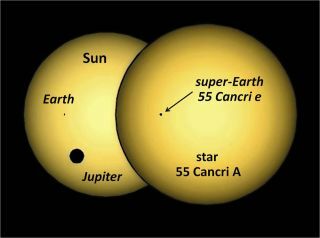 55 Cancri d is one of the swingers. Kaib and his team ran more than 450 computer simulations of the 55 Cancri system, taking into account the influence of the companion star. The researchers decided that the spin axis of 55 Cancri d probably flips completely upside-down after millions of years. The planet's north pole finds itself pointed in the direction the south pole once claimed. Even more intriguing, the planet, which is about four times the size of Jupiter, causes the smaller bodies in the system to swing with it. The influence of the companion star was probably overlooked until now because it is so distant, Kaib explained. "Other studies looking at the effect of binary stars on planets tend to focus on tighter binaries," he said. Closer companions make for unstable orbits, but the 55 Cancri system showed no obvious sign of orbital disruption. "This planetary system looks very well ordered," Kaib said. Exactly how long it takes the planets to swing from top to bottom depends on the time it takes the two stars to circle one another. Unfortunately, that's tough to nail down, researchers said. Kaib and his team modeled a variety of paths for the two stars and found that most of them resulted in severe axis shifts for all five planets. The research was published in the December issue of the Astrophysical Journal Letters. In its solar system, 55 Cancri d is the most distant of the five planets from their sun — a little farther than the distance between Jupiter and the sun. Three others are packed into orbits closer than Mercury is to the sun. The closest of the five, the dense planet 55 Cancri e, completes the orbit of its sun in less than 18 hours. From Earth's viewpoint, the tiny planet passes directly in front of its parent star, which is expected to allow astronomers to measure a number of properties, including the angle of its spin orbit. At about 8.5 times the mass of Earth, 55 Cancri e would be the smallest planet on which astronomers have detected a spin angle. Kaib says that he spoke with several other observers experienced in determining the angle for extrasolar planets, and they are confident that it's possible to calculate the spin axis angle of 55 Cancri e.
But Kaib cautions that the observational evidence may not be conclusive. The simulations model the star as a perfect sphere, but like most rotating bodies, it probably contains a bulge around its equator. The tidal forces from this bulge could act to erase evidence of the tipping of the orbital axis. Astronomers compare the axis of the planets to the axis of the star to calculate just how much the planets have tipped. "As the planets precess, they could drag the star along with it," Kaib said. The orbital inclination of the star would then increase along with those of the planets, so the whole system could wind up on its head.